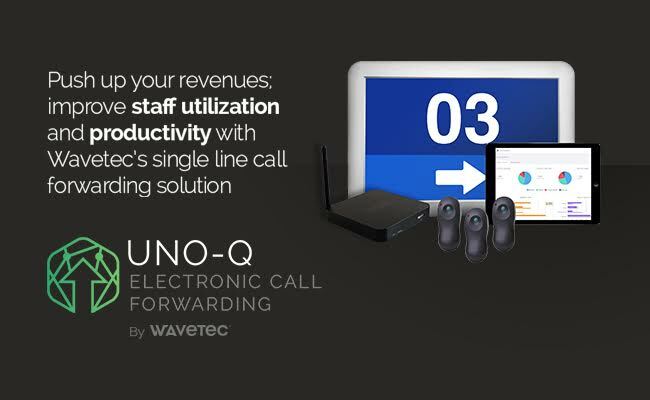 Dubai, UAE: Wavetec, a global leader in Customer Flow & Journey Management solutions launched a state-of-the-art linear queuing solution UNO-Q at its headquarters in Dubai Silicon Oasis. Designed primarily to help retailers and customer-centric businesses manage customer flow and reduce waiting times effectively, UNO-Q is a plug-n-play, ticketless electronic call forwarding solution that flexibly integrates with digital signage solutions to engage customers and provides real-time insights into in-store traffic and customer flow with manager dashboards and live reports. This next generation technological solution has new features like enterprise connectivity, wireless connection, digital graphical display, cloud-based configuration and supports up to 32 counters to improve linear and single line queuing experiences at small retail stores, pharmacies, clinics, service centres, restaurants, post offices, laboratories, deli counters and Telco centres. Long queues and waiting lines are a chief complaint of customers and a great problem for retail format customer service stores. UNO-Q addresses this challenge by allowing customers to queue in a single line and move towards the next empty counter one by one when a teller presses the call forwarding button. Ideal for simple and single phase transactions, this single-line waiting system is cconfigurable according to r specific requirements and service counters. With the capability to improve staff utilization, increase operational efficiency and streamline customer flow management at retail checkouts and cash counters, UNO-Q has an edge to control queues, reduce walk-aways by 80% and minimize waiting times by almost 40%. With a global footprint and customer journey management solutions that meet world-class standards, Wavetec delivers customizable and integrated queue management systems to help businesses organize customer flow, engage customers and measure customer journey indicators. Wavetec is a multinational technology company offering an ecosystem of customer experince solutions for the improvement of the service areas, meeting the company’s needs in organizing the influx of people, guaranteeing a valuable engagement experience, and obtaining relevant measures for the decision-making process so as to improve business results. The Wavetec Customer Experience Solutions are located in different regions with applications in various areas and industries such as hospitals, retail and banks. Some examples of the technology can be found in the BCI Chile, Barclays, KCB, Emirates Airlines, Etihad Airlines, Samsing, Interbank, Tesco, LIDL and Chilexpress.